There are few things in this world that need to be taken seriously. They are rarely the things your parents told you to take seriously. I mean, getting an education is all well and good and getting a job is probably a good idea in the long run and all that, but the truly important things you have to come to all by yourself. Once you realise, for instance, that the bacon sandwich is truly the single greatest culinary creation known to man, then that kind of frees up the rest of your morning. And when you realise that there are people out there dedicating themselves to the perfection of your bacon sandwiches then it makes you very happy indeed. It is only natural that we should look for novelty in our food, look out for new tastes and smells, let ourselves be mesmerised by the wit and daring of terribly clever chefs but in the end, a couple of slices of bacon in bread, with a dash of good ketchup and a suggestion of mustard is probably as good as it ever gets in this life. I'm sure every British male reading this (that means you, Jim) will vouch for me on this one. In fact, I will go far as to say that there is a deep and abiding connection between us Brits and the Bacon Butty. Even at its very worst, made with white bread with anaemic flaccid bacon in a motorway service station at 3.00 in the morning, dowsed in vinegary ketchup it fortifies and strengthens the resolve. At its best it is a sublime moment of utter transcendence. It is such a great leveller too. In many ways we are still riven by class in this country, we all have a strong sense of where we fit into society. It has become quite subtle it the way it expresses itself but we all feel it in some way. The so called food revolution in the country is still predominantly a middle class affair, odd, since the British food we love to bang on about is about as working class as it gets. Yet, everyone feels comfortable with a cup of tea and a bacon sarnie, it is something that everyone can recognise the value of. 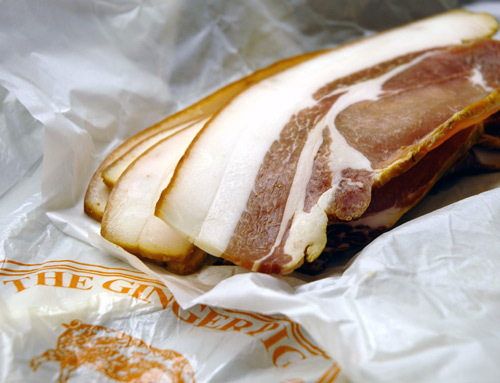 The bacon pictured above is probably one the finest bits of pig you'll find in this city. It's Gloucester Old Spot smoked shortback from some people who know a thing or two about pigs. The Ginger Pig Farm are reckoned to be some of the best suppliers of pork in the land and I'll not be one to argue, they have a permanent stall at Borough and a butchers shop in Marylebone and there is some debate as to whether the sausage rolls they make there are superb or simply great. I won't be drawn on the argument. It's far too serious a decision to be made quickly. send me a sausage roll and i will tell you. I YEARN for one right now, since you mentioned it. It is a thing of beauty indeed! Oh, yes, now. That's bacon. I'm almost smelling it now. BUT! I had no idea you put ketchup on a bacon sandwich! Mayo, maybe (a la BLT). Huh. But ketchup? And a smidge of mustard? Sam -- and MG -- tell me about sausage rolls. Probably just what it sounds like, eh? Greasy and juicy and mmm. I think the English do fantastic pork all around. The overall quality of the meat was something I noticed on arrival from NZ. I'm touched at your promotion of me as some kind of British Everyman! Though brown sauce is my condiment of choice in Bacon Sarnies (I think the capitalisation is deserved). Having said that, I was recently introduced (I'm slow on the uptake sometimes) Heinz Organic Tomato Ketchup. Quite a revelation. And a rare case of making the best better. MmMmMm, bacon. Went through several pounds last Saturday, easy to do. I just had a flash, kinda odd really. I found an image of bacon pizza in my mind, off to the left. See? Right over there, that's it. Bacon pizza. Oh man, I can see it now. There will be one day, set aside where everyone will eat some form of bacon on 1 special day. This would most likely be, International Bacon Day. A day where bacon would be celebrated from breakfast to your nightcap as you're crawling in to bed. Last Sunday I woke up smelling bacon in my beard, that was a bit much. Thought I got that out of there. All I could think of was a bacon sandwich...well, to be more precise, a bacon and egg sandwich with a slice of *real* cheddar, a few slivers of onions and some chilli flakes on a lightly toasted cheddar bagel (not nearly as nice as the beigel you wrote about earlier).